We all know that a picture can tell a thousand words, but how about a graph? For my money, I’d suggest that they can tell rather a lot too. And, to keep the slightly confused mixed-topic-analogies going, one mustn’t forget that there are lies, damned lies, and graphs. Consider the following graph from this excellent website. 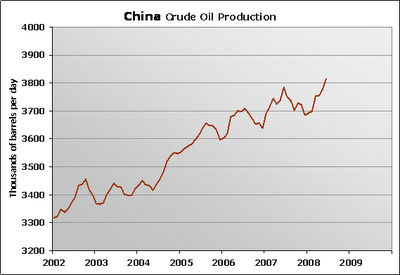 This clearly shows that China’s production of crude oil is rising steeply. This is no doubt a good thing (though not necessarily for the planet). 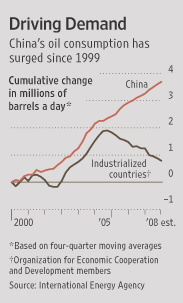 Everyone knows that China’s demand for energy is rising and seemingly insatiable. 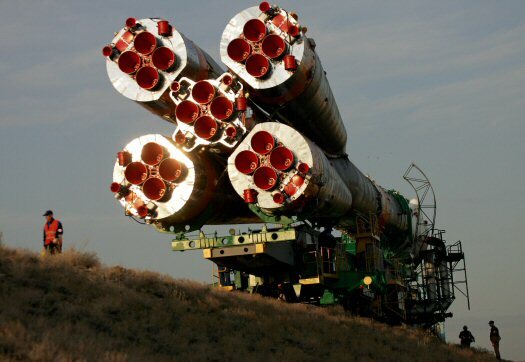 So if they can produce such an amount (and such a large increase) of oil, this leaves more for the rest of us. This would mean that there would be marginally less demand on, for example, Middle Eastern oil, and this can but only help the price stay one or two cents lower. However, consider the following graph. 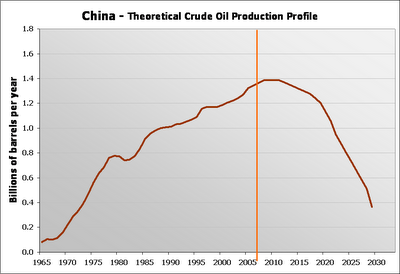 This is taken from the same site and shows China’s predicted oil reserves. The rising red line to the orange vertical line is the actual known production. The line on the other side is the predicted curve using the Hubbert curve. This is a formula used for predicting when oil will run out. It suggests that the rate that a country can find and produce oil (how steep the initial curve is) will be mirrored in terms of its downturn after the peak has been reached. The author of this thesis – King Hubbert – was initially ridiculed for this thesis, but was proved eerily correct when he correctly predicted – decades before the event – that American oil supplies would peak and begin to fall in the 1970s. This graph, obviously, is not as positive. Moreover, it is rather pessimistic. Just look at the predicted precipitous decline of production of barrels of oil, beginning in the next five to ten years. Such a steep decline means that China will inevitably dive into other sources of oil at quite a rate come 2020, according to the prediction. Obviously, China realise this to some degree and are currently scouring the world for oil as we speak, but this search will turn into something of a mad panic should the decrease be as steep as predicted. For it is one thing to plan for a future problem; it is another if and when the problem is immediate and rather larger than expected. Needless to say, such a massive leap in demand would cause an equally large rise in the price of oil. And the situation gets worse. Look at the following small graph. The vast Chinese demand for oil can clearly be seen here and there are few indicators suggesting that this demand will slow that much. Certainly it will not drop or even markedly drop off. Therefore, couple this large increase with the previous graph and there is a worrying conflagration of factors that bode ill for oil supplies and in particular the oil price in the near future. These graphs show that all angles of a problem must be examined before a conclusion is made. If one were only to see first graph, the prognosis might be significantly rosier than it perhaps ought to be. One can only hope that either Hubbert’s equation is wrong this time or I’ve simply missed out a crucial graph or three. 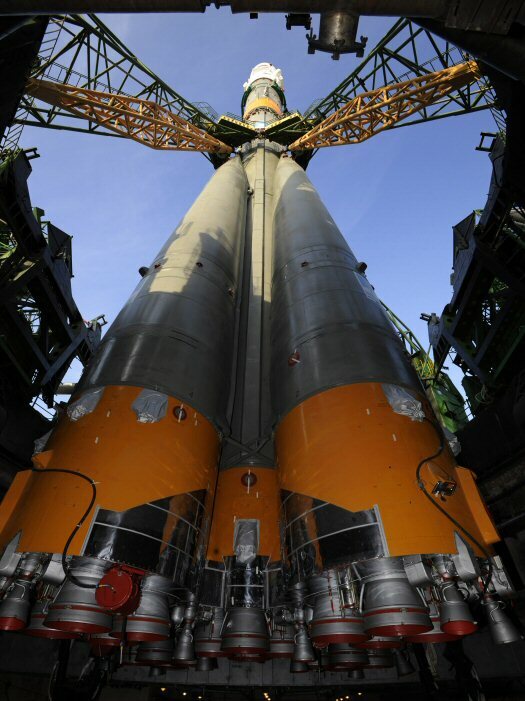 Foreign Policy has some impressive pictures in this month’s issue of the Russian rocket that took Richard Garriott into space last week. 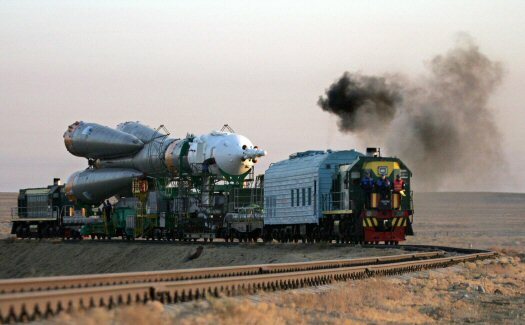 Despite the muted notions of a new cold war, surely examples of cooperation like this suggest that such notions are wildly off the mark. Inshallah.